Fifty-six percent of CMI respondents expect to increase their content creation spending next year. Other techniques B2B marketers reported using to research their target audience for content marketing include website analytics (73 percent), keyword research (65 percent), secondary research (53 percent), social media listening (50 percent), and database analysis (45 percent). 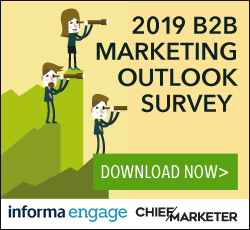 In the B2B Content Marketing 2019:Benchmarks, Budgets and Trends—North America report from CMI and MarketingProfs, nearly three-quarters of respondents (73 percent) also plan to use personas for content marketing by the end of 2018. Email campaigns were the top content marketing method B2B marketers are using to nurture their audiences, used by 87 percent of respondents. This was followed by educational content (77 percent), clear calls-to-action (62 percent), in-person events (61 percent), storytelling (45 percent) and offers/incentives (27 percent). Content creation was the area where respondents were most likely to increase spending, reported by 56 percent, followed by staff (37 percent) and paid content distribution (36 percent). Only 29 percent are looking to increase investments in content marketing tech. 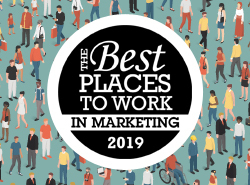 Eighty percent of respondents to Chief Marketer’s recently released 2019 B2B Marketing Outlook survey said that marketing was responsible for creating content for their team. Less than 25 percent said they relied on freelancers, third party providers or a dedicated editorial team for content creation. The top types of content for moving prospects through the funnel in Chief Marketer’s survey were articles/blog posts and reviews/customer testimonials (both cited by 45 percent), followed by whitepapers (32 percent) and video (31 percent). In the CMI survey, audio/visual content—such as videos, livestreaming and webinars—showed the greatest increase in usage, with 64 percent saying their use of such formats had gone up compared to one year ago. Written print content—such as magazines, books or brochures­—showed the lowest increase, 27 percent.